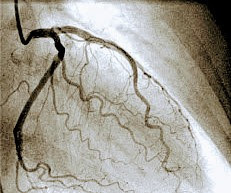 Angiography is a radiographical imaging of blood vessels by injecting a radio opaque dye. When the physician written for a angiogram, I prepared my mind to go through. Now I am in hospital bed, waiting for the people to take angiography for me. The nurse asked to wear the blue hospital gown. She tried to put razor on my right hand wrist. I asked the reason. Its where the physician will inject the dye which passes through the arteries to show the deformities in blood circulation. 'I have to remove hair from your thigh also, its an alternative,' she told. She did her work patiently and she was used to that, I think. She enquired about my profession. Her calm face just enlightened. 'I am always eager to meet a person who writes. Are u listen to people to create stories... ' showered questions, that i can't excite more. Just smiled back. I am in a different fix of mind. What in necessary I have to take an angio, what being the result, is the process painful, what is the positive or negative results of that, I am worried. Table is well set and I was laid on that and lotions are applied for suckers of the machine. Many wires crisscrossed my body. A rectangular monitor machine huge in size is attached to the table and it moved its dark face here and there around me like the head of the Chinese river dragon, Apalala. The assistant man there, saw the fear in my eyes and asked 'feared?'. Want to tell him its a dragon that he is moving, but feared of his laugh, I ping-pong my head with a big NO. Doctor came in and I felt an air of activity. My face is the mirror. He grabbed it. 'Nothing big is going to happen. Relax yourself. I'll inject a dye through your vein in your arm. It pains a little when I push it inside. Bearable only. I know you are a bold person (who told? my stories?) So, no worry.' Now I have no other option. Kept a bold face and waited for the prick. He inserted the needle with dye and had a moving wire having a camera, I guess in his right hand. He moved it over my chest and his eyes were fixed on the screen above the moving dragon head. Last two insertions of dye pained me a lot. He told, 'I know its painful. Your blood arteries are so thin. And we dont want to prick a vein in thigh for the last ones. Bear a little,' in a comfort voice. Then he finished off. And moving away from me he murmured, 'Blocks are there. We'll clear. Dont worry'. I didn't fully realised his words. The nurses went on changing my gown. Again I was laid on a bed in ICU. Now my mind went back to his words. Few moments later, one doctor came with a friendly smile. Introduced himself as heart surgeon Dr Krishna Kishore. I vaguely remembered of seeing him walking between rooms during my previous hospital visits. I smiled back. He explained my real condition is so worse that there were seven blocks, one is in the main artery, near the starting point where blood enters the heart. 90%, 80%, 70% like these he had some mathematics with him. He sketched the heart and its blocks. 'Shall we keep the surgery tomorrow?' is the last straw he added. First time i heard that word surgery. Its a big and frightening thing to grasp. I blankly stared him. Just then my cardiologist who did angio came in. At any sobre circumstances, if you want to break down, a near and dear one or a friend or a known person is enough. Here, my family friend and cardiologist is enough for me. Tears rolled down my cheeks. I just want to control, but then my husband Puhalenthi also entered. More tears and hospital gown is not suited for soaking. I asked the nurse to get me my napkin, I had with my clothes. She screeched the cover and gave me the napkin. At that time I stopped my drip irrigation. I have to be bold. Three opposite genders are watching. What they will think, as usual a lady opens her fountain? 'You are a writer, voraciously writing and speaking women's issues in stories and articles. You must not feel weak before menfolk. No way. Stop Ahila', I told myself. Face bold. Then I sit straight and asked about the blocks. They explained everything. Inside I am breaking down to pieces. Surgeon is little speaking man of good stature. He knew the person's caliber, whom he is speaking to. Some implied meanings in his statements are understood by me. 'Seven blocks are there. Will do bypass for four arteries. The remaining ones we can leave as they are tiny vessels and having calcium deposits only. We will take nerves from your leg for bypassing the block in the four arteries. I'll do my best. You'll get a new heart. No need for immediate answer. Think and tell tomorrow.' Beautiful way of crafting words. I surely believe he is a best surgeon. He is new to me, so putting my belief on him is important. I saw my family doctor and cardiologist Chockalingam. He said, 'He is the best man for this job. I endorses him.' Totally i agreed to the bypass graft surgery on belief and faith that I kept on those people. I dont have heavenly faith. Always believe people and their truth. Nice narration of experience.Almost all people enjoy similar experience before angio procedure.But seven blocks is somewhat too much. I think you have ignored symptoms.But experience after cabg will differ from person to person.you may write about it. Thank you. I had written a book in Tamil, 'Nintru thuditta Ithaya'. Written the whole experience - surgery & after.